We’re happy to announce the latest offerings for fall. A three and six jar gift set of jams that are perfect for entertaining! The set includes our ever popular Spiced Carrot Jam, Red Pepper Jelly, and Cranberry Orange Jam. The three set includes a jar of each while the six set has two of each. All of these preserves are lovely served along side various cheeses and with meat. Don’t forget the day after sandwich! Turkey with Cranberry? Yes, please. Pulled pork with Spiced Carrot… AMAZING! And well, Red Pepper is also fantastic with everything. Both are available at the Serendipity Store. ser·en·dip·i·ty (noun) the occurrence and development of events by chance in a happy or beneficial way. Recently while at the Old Monterey Farmers Market I met a lovely young woman named Erin, who was visiting from Paso Robles. As she looked over our various flavors she noticed our Hot Red Pepper Jelly. I offered her a taste and explained it was a brand new flavor for us that week. As we began talking she told me that she worked for Cass Winery in Paso Robles and had been sampling every pepper jelly she came across recently for inclusion in their November wine club shipment. She bought a jar, and after it was tasted by the winery’s chef and employees, Serendipity Hot Red Pepper Jelly was their first choice! An order was placed, the jelly was made, and a date was set to deliver. We really enjoy making deliveries personally, but the trip to Cass was an extra special treat and almost felt like a vacation, if only for a few hours. As I exited the freeway and began to wind around through the rolling countryside each mile became more beautiful than last. I was surrounded by oak trees, horse farms, and acres of vineyards as far as the eye could see. It seemed as if there was a new surprise around every turn! Finally, the vineyard and winery appeared on my right with beautiful outdoor dining areas shaded by ancient oak trees. It was absolutely breathtaking. Erin greeted me, and after the delivery was complete, the tasting began! Not being a fan of oaky chards or sweet pinks, their Rhone styles are just what I enjoy. The whites are bright and crisp and the reds are very fruit forward. After many ski trips in the 60′s fueled by Grenache Rose, I am particularly skeptical of anything pink, but their rosé was light, dry, and very flavorful. The first sip took me straight back to a sun dappled terrace in Provence where I recently enjoyed a long, leisurely lunch. Cass has two wine club shipments annually and the November 2010 shipment will also include a jar of Serendipity Hot Red Pepper Jelly,as well as recipes to pair with all of the wonderful Cass wines. Our favorite is the popovers, and we hope you will try it for your Thanksgiving dinner. They’re really easy and only take about 15-20 minutes to make and pair beautifully with the ‘09 Cass Rockin’ One Blanc. Lay out the crescent dough as per the instructions. Place a teaspoon of jelly, and 1 of cheese on the corner of the dough that you are going to roll up, as per the instructions on the packaging, but gently pinch the corners of each crescent. This will keep the filling in place as they bake. Bake the rolls on a rimmed cookie sheet according to the instructions. After removing them from the oven, let them sit for a minute to cool. The filling will be VERY hot! 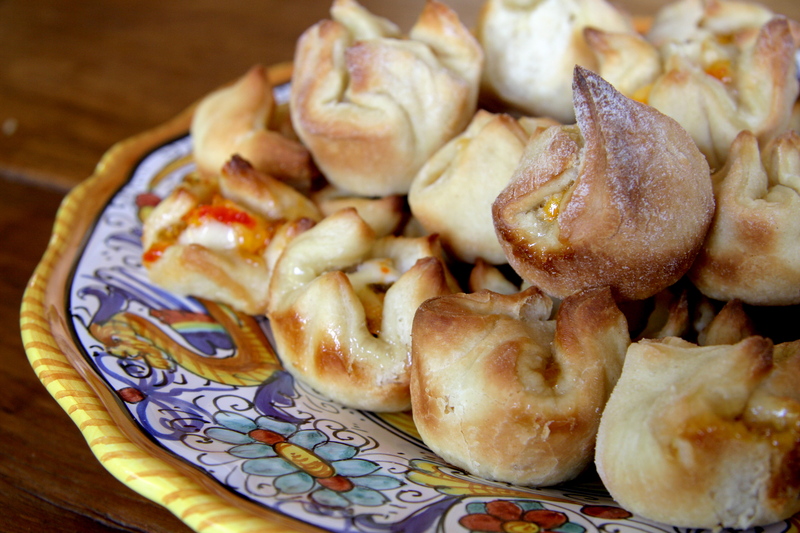 Of course when I went to make these I did not have crescent rolls in my refrigerator or freezer, but I did have yeast, flour, eggs, honey, butter, and salt. Which meant that I had all of the ingredients needed for brioche. I followed the simple recipe from Artisan Bread in Five Minutes a Day. I recommend making half of the recipe unless you need a lot of popovers or if you’re in the mood to make to-dye-for cinnamon rolls or a jam swirl bread. Once the dough is ready (ie two-hour rise and another 30 minutes in the fridge) roll it out and cut into 2×2 inch squares (I used a pizza cutter for this part) to fit into a mini muffin pan. Each cups receives a teaspoon each of goat cheese, Neuchâtel, Marscapone, or cream cheese and our Red Pepper Jelly. Then bring the corners into the center and pinch together. Let them rest and rise for another hour and then place into a preheated 350° oven and bake for 12-15 minutes or until gold brown. This version takes a bit longer to make but they’re so incredibly tasty and the brioche is just amazing! The Tasting Room at Cass is open daily, 12-5pm weekdays and 11-6pm on weekends. The Cass Café is open daily for lunch from 12-4pm. Current releases are available for retail purchase and wine samples are poured at your table or at the bar on a rotating basis. Any of the Serendipity pepper jellies can be purchased at our farmers markets or online at www.SerendipitySpreads.com.